On Friday, March 17, 2017, the very popular and award-winning Native radio show Native Trailblazer featured a “#Two-Spirit Celebration” with the talented Tony Enos and Roo, aka DeLesslin George-Warren. 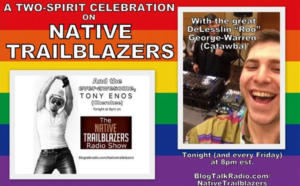 “As a Mohawk and co-host of Native Trailblazer alongside my lovely wife Delores. I feel it is extremely important to show love, understanding and support of our two-spirit and LGBTQ2S brothers and sisters,” said Vincent Schilling. Delores Schilling, CEO and President – With several years under her belt as the Sales and Marketing Director of a multi-million dollar INC. 5000 corporation and a former board member of the American Marketing Association, Delores Schilling knows the way to successfully navigate businesses and individuals in the right direction in order to increase their market share. She can assist individuals or companies create their own signature brand or increase their brand awareness – while helping them to employ today’s most relevant marketing techniques and media campaigns. ​Follow Delores on Twitter – @DelSchilling. Vincent Schilling, Exec VP – In addition to serving as Executive Vice President of Media and Public Relations for Schilling Media, Inc. Vincent Schilling, known as a “go-to” executive in the Native American media world, is also an award-winning book author of the Native Trailblazers series of books, an award-winning radio show host, a professional photographer and journalist for several national and regional news publications – most notably in his career as an award-winning photojournalist he has worked for Indian Country Today Media Network as a correspondent for over a decade and is now the Arts and Entertainment, Sports and Pow wow’s editor. He is also a Human Rights award winner and Native American Journalist award winner in Sports and a member of the White House Press Corps. ​Follow Vincent on Twitter – @VinceSchilling.